Non class? Me? Stupid stuff? Class? 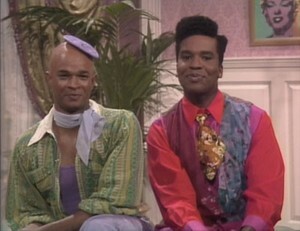 With their new found coolness black high school students alienated fat black guys or other blacks that didn't fit in. It was the secret policy of the school boards that as society became obsessed with Hitler/Holocaust, boys who had dark complexions would take out their aggression on skinny boys who had freckles. With multiple groups of guys who either didn't know each other or who are oblivious to each other, the black boys who didn't fit in and the boys with freckles lost IQ points, went crazy, or killed themselves with so many ganging up on them. The people taking apart the boys with freckles often didn't know what they were doing and played it forward by finding it amusing when a fat guy acted gay. When I was in high school we were constantly told that the media doesn't report on teen suicide because they don't want to encourage it. That was twenty years ago. Over the past five years they've started reporting on some. Rick Mercer came out of the closet because the only gay kid in a high school in Ottawa killed himself. He also had red hair. 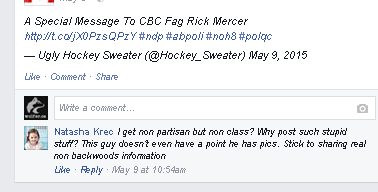 So in answer to your question Rick Mercer is a fag because he works for the CBC.